Grace Park Animal Hospital presents our annual Halloween Pet Costume Contest! We will be accepting photos of your pet in costume now through October 21, 2018. Upload your pet's photo with a short caption. Limit of one photo per pet (photo may be a collage that shows different views of the costume) or group of pets (multiple pet group costumes are allowed). Voting will begin on Monday, October 22nd and go through Wednesday, October 31, 2018. Winners will be announced the week of November 5th. Prizes will be awarded to the top three pets with the most votes! Good luck - we can't wait to see some awesome costumes! Need some ideas? Visit our Halloween Contest photo albums on Facebook to see our previous contestants or visit our Pinterest page for costume ideas. Let the voting begin! Thank you to all of the participants in this year's pet costume contest. Now it is time for the best dog or cat to win! Cast your vote every day Monday, October 22nd through Wednesday, October 31, 2018! The lucky winners will be announced the week of November 5th. Prizes will be awarded to the top three pets with the most votes! Winners will be selected based on how many people vote on their pet's photo. Your pet must be a current patient at Grace Park Animal Hospital. One photo per pet, please. 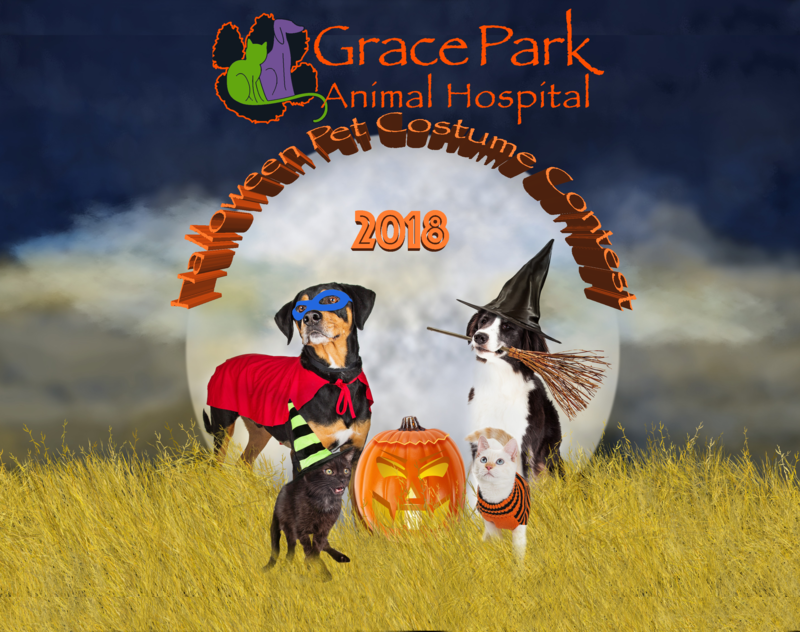 By submitting your photo, you are granting Grace Park Animal Hospital rights to use your photo for this and future Halloween Costume Contests. All images submitted must be the work of the individual submitting them. Winners will be selected based on how many people vote on their pet's photo. The prizes for this contest are a Pet Portrait Photography session or a credit on your account to be used towards services and products at Grace Park Animal Hospital, not redeemable for cash. No cash reward will be given. This promotion is in no way sponsored, endorsed or administered by, or associated with, Facebook. You are providing your information to Grace Park Animal Hospital and not to Facebook. The information you provide will only be used for Grace Park Animal Hospital's Halloween Pet Costume Contest.